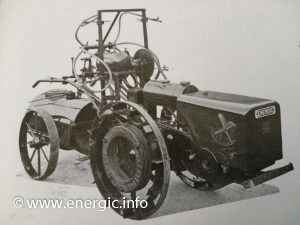 The Energic motoculteur was very versatile. 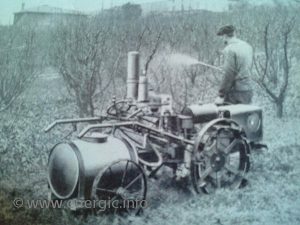 As part of its duties it was adapted to run various sprayers (pulvérisation) for insecticides, fertilizers, washers, chemicals and much more. 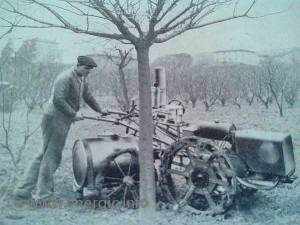 This was predominantly in the viticulture, orchards and fruit growing farms. 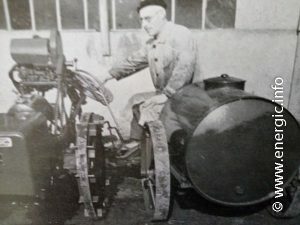 These adaptions where progressive and it was a testament to the robust design that such a array of equipment could be powered from the machine. 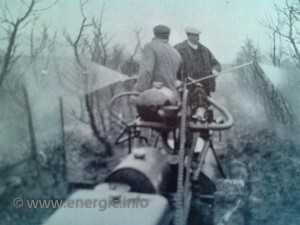 The earliest sprayers where operated from the Energic motoculteur C7 B4L and latterly on the Energic S bloc C7 and D9 motoculteurs. 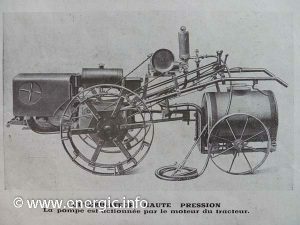 The piston operated pump (3 vitesse) operated, to a maximum pressure of 15 kgs by a chain drive direct from the moteur. There was enough pressure to operate 2 adjustable lances through flexible hoses up to 4/5 meters. Using a large 150 liter articulated reservoir they could be operated through narrow confines and over a long period. Spraying orchards, very maneuverable within the confines of the tree planting. Spraying from 2 hosed lances, with a pressured feeder tank.Note the lack of protective clothing and breathing mask’s. At the factory, final inspection pre delivery of a Energic C7 S Bloc, with spray system and reservoir. similar to the one below. Energic C7 or D9 spraying combination with sulky and reservoir. 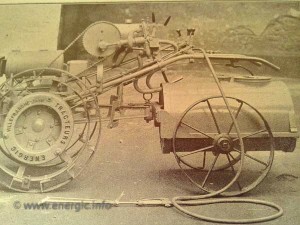 A later model with a larger tank on a Energic motoculteur S bloc C7. Chain driven pump. The task of spraying was ideally suited to the Energic motoculteur with the powerful adaptions available.